Reverse Engineering (RE) is an ad hoc and creative process of extracting the knowledge of design and implementation information from anything we use in reality. Similarly, reversing a software is a practice of analysing the software to examine its internals when we don’t have the source code and utilizing the knowledge we make fun from it in a beneficial manner. In today’s world, there are many reasons for reversing a software. These days the primary purposes of reversing a binary or software are to develop competing products or cracking the existing commercial software. Reversing is very popular when it comes to crackers that defeat various copy protection mechanisms of the software available. Software Reverse Engineering comes in various forms; a malware analyst needs to perform RE to analyse things like malicious software, a Worm or a Trojan which are wide spread. A cryptanalyst will choose reverse engineering to learn cryptographic algorithms and subsequently attempt different ways to crack the encryption/decryption algorithms. In addition, tech companies, that develop million dollar products, will employ a reverse engineer to audit the software to comply with digital rights management (DRM). In all the above cases, we really don’t need the source code of the software. In fact, if we have the source code we don’t even need to conduct RE. radare2 is an open source reverse engineering framework used for static and dynamic analysis, digital forensics or software exploitation supporting multiple platforms, architectures and binary formats. Radare2 is shipped with a few other important tools for file metadata extraction, base conversion, unified binary diffing and many others. This program, is not only a great disassembler but also a good debugger, especially when you love working on CLI (command-line interface). Mastering radare2 is not simple since one must remember a multitude of commands in order to use it. But again, it has intuitive command-line control to write, as compared to writing code using the IDA bindings. If you are familiar with IDA Pro or Hopper and you are a CTF player then you should try radare2. At Loginsoft, we believe that radare2 is an essential tool for reverse engineering any software. In this series of articles, we are going to walk you through the basics of software reverse engineering using radare2 by analysing the crackme challenge (crackme0x04) which can be downloaded here. Once we have the binary downloaded, we need to learn the behaviour by dynamic analysis; run it with different set of inputs in order to do this. Now, it is very clear that a simple ordinary brute force technique is not going to work to capture the flag. It’s time to utilize radare2 libraries to extract the information of the binary ‘crackme0x04’. Using rabin2, retrieve information out of a binary like strings, sections, entry points. This tells us that this program will run on Linux and it was coded in the C programming language. We can also see the bin-type being “elf”. And there are few strings used in the binary. Let’s roll up radare2 (r2), the main binary. ‘r2’ command takes path of the binary as an argument along with few useful switches (‘-w’,’-d’) which will be covered in the next article. Following the syntax ‘r2 ./crackme0x04’ will bring up the binary on neat and intuitive radare2 CLI. By observing the functions listed above, we can see several functions ‘printf’, ‘scanf’, ‘main’, ‘check’ being used in the binary. On performing dynamic analysis initially, the function ‘sym.check’ seems interesting. We can use command ‘axt $address’ to check where exactly the code was referenced. The function ‘check’ is called in the ‘main’ function at the address ‘0x8048559’. From this we can determine whether or not the validation part exists in the function. Let’s dig into the function using the command seek ‘s’. 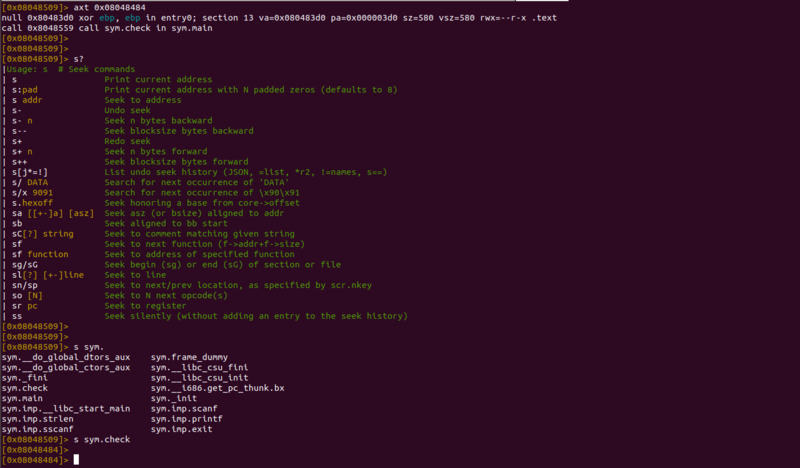 As previously mentioned, we can view a list of subcommands by using ‘?’ as a suffix to the seek command. Now the fun part comes with disassembling the function ‘check’. Radare2 provides another command to print disassembly code of the function using ‘pdf’. ‘pdf @ main’ will analyse the main function and print its disassembly. Similarly, ‘pdf @ sym.check’ prints its disassembly of the ‘check’ function. |      ||   0x080484bb      c74424043886. mov dword [local_4h_2], 0x8048638 ; [0x8048638:4]=0x50006425 ; "%d"
Another way we can do this is by modifying the binary at address ‘0x080484da’ by overwriting with NOP (\x90) to avoid the conditional jump and to print “Password OK!” on any input that user provides. In order to do that, we must run the binary with writable mode (-w) using radare2. Here comes the final solution. Challenges like ‘crackme’ will help us learn how to reverse software. We will look at a few other features of radare2 by cracking another challenge in the next article. We hope this guide has given you a better understanding of radare2.